Grand Canyon University has frozen tuition for the 11th consecutive year. PHOENIX (Oct. 22, 2018) — Grand Canyon University, which completed its transition back to a nonprofit status earlier this year, announced today it is extending the tuition freeze on its west Phoenix campus for an 11th consecutive year. That means tuition for the 2019-20 school year will remain at $16,500 for existing and incoming students, which has not changed since 2009. However, the vast majority of students — more than 90 percent — receive institutional scholarships that cut the average tuition cost nearly in half, to $8,800. That total does not include federal aid such as Pell grants and subsidized student loans or external scholarships that lower students’ out-of-pocket expenses further. According to data released last week by the College Board, the average cost of in-state tuition and fees at four-year public universities in 2018-19 rose 2.5 percent to $10,230, while tuition and fees at four-year private nonprofit institutions jumped 3.3 percent to $35,830 during that same period. Over the past decade, tuition has risen 35 percent and 26 percent at four-year public and private nonprofit universities, respectively, while the cost to attend GCU has remained unchanged. As a result, GCU graduates are incurring far less debt (an average of $18,750 according to the latest 2013-14/2014-15 data from College Scorecard) than the average at public and private nonprofit universities ($28,650 according to 2017 data from the Institute for College Access and Success). Housing costs at GCU also fall far below the national average. 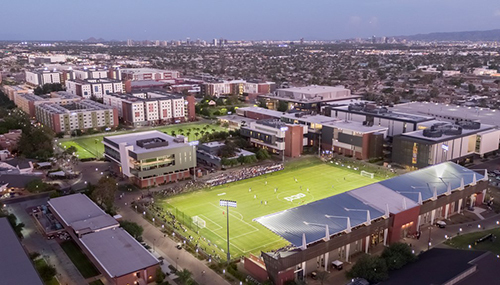 Despite the University’s decision to now build only single-occupancy apartment-style residence halls that its students desire, GCU’s average room and board cost of $7,950 remains well below the national averages for public four-year schools ($11,140) and private four-year universities ($12,680), according to the College Board. Two more apartment-style residence halls were built this school year, increasing the percent of single-occupancy rooms on campus to 38.2. Three more apartment buildings with approximately 1,800 beds are planned to accommodate enrollment growth for the 2019-20 school year, which will bring the total number of residence halls on the 260-acre campus to 24. All but two of those have been built in the last 10 years. Other new construction for this school year includes a new classroom building for the Colangelo College of Business, a Canyon Activities Center, another parking garage for students, new campus dining options in Taco Bell and Pita Jungle, and an expanded Lope Shop merchandise store. An additional 1,000 field-level seats will also be added at GCU Ballpark by the spring. 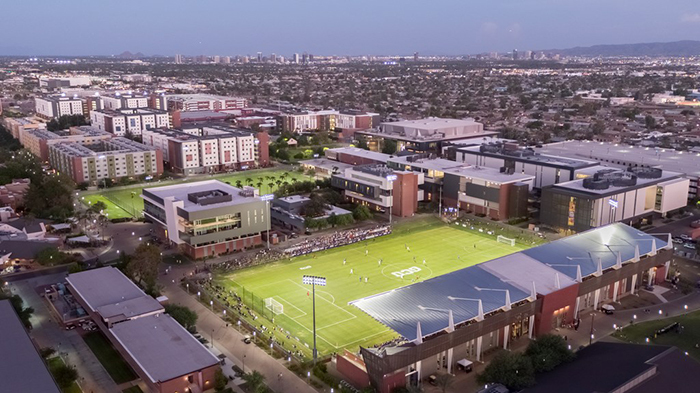 About Grand Canyon University: Grand Canyon University was founded in 1949 and is Arizona’s premier private Christian university. GCU is regionally accredited by the Higher Learning Commission and offers more than 230 academic programs, emphases and certificates for both traditional undergraduate students and working professionals. The University’s curriculum emphasizes interaction with classmates, both in-person and online, and individual attention from instructors while fusing academic rigor with Christian values to help students find their purpose and become skilled, caring professionals. For more information, visit gcu.edu. I want to take the time and say thank you for your college and all the things that it has to offer and I like for what it stands for and the belief in God. I love the fact that this school offers so many different degrees and can be offered online.